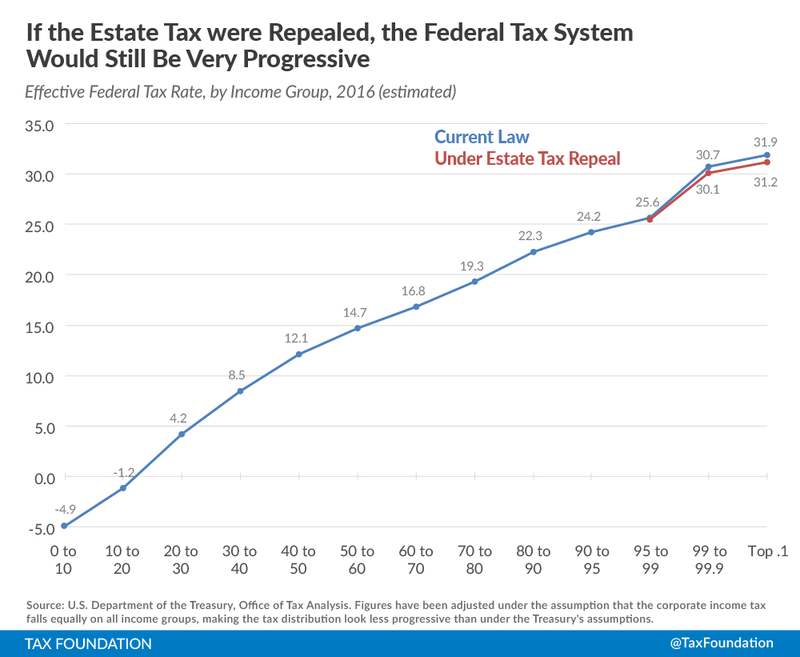 The article, by RJ Eskow, is about Trump’s proposal to repeal the federal estate tax. Over the last few days, Trump has faced a great deal of criticism for this proposal – but none so hyperbolic as the claim that eliminating the estate tax would create a “permanent aristocracy” in America. In fact, the estate tax is a small, relatively inconsequential piece of the federal tax system. Eliminating the estate tax would lower taxes on the wealthiest Americans – but not by much. 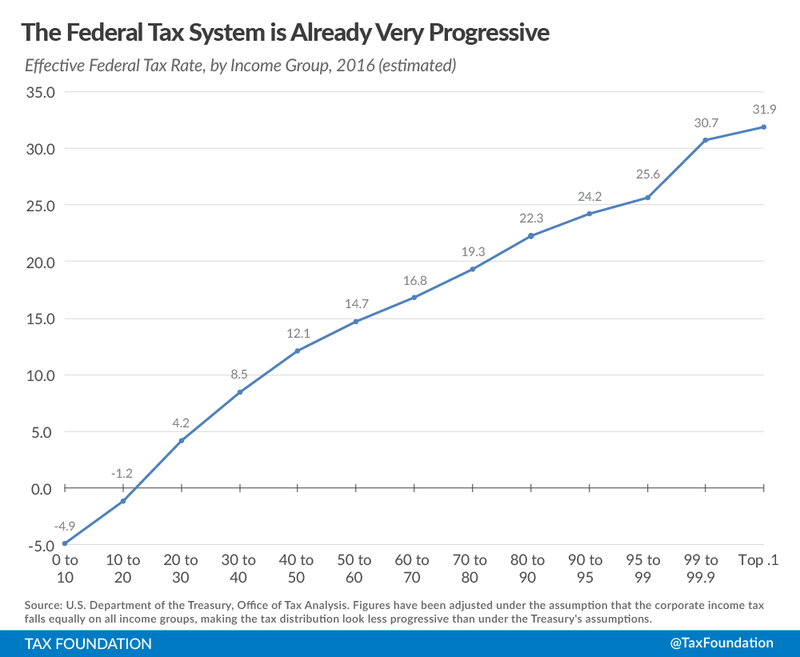 Even if the estate tax were repealed, the federal tax system would still remain highly progressive. 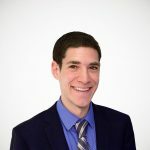 The first mistake in the AlterNet article is the claim that “our tax system already favors the wealthy in many different ways.” Frankly, this just isn’t the case. According to the latest estimates for 2016 from the Department of the Treasury, the top 0.1 percent of taxpayers will pay 39.2 percent of their income in federal taxes. Meanwhile, the bottom 90 percent of taxpayers will pay 14.1 percent of their income in federal taxes this year. Using the same data from Treasury, I’ve graphed how much each income group would pay in taxes in 2016 if the estate tax didn’t exist. The change is underwhelming. Under this scenario, instead of paying 31.9 percent of their income in taxes, the 0.1 percent richest American households would pay a tax rate of 31.2 percent. In other words, even if the estate tax were fully repealed tomorrow, high-income taxpayers would still shoulder the vast majority of the U.S. tax burden. Supporters of the estate tax argue that the tax helps lessen the concentration of wealth in the United States. That’s a fine argument, and people should keep on making it. But claiming that estate tax repeal would create a “permanent aristocracy” is pure misinformation, and is not useful for a productive tax policy debate. To clarify, the headline text might have originated with an AlterNet editor, rather than with RJ Eskow. Either way, somebody is very wrong about the federal estate tax.